Although carotid endarterectomy (CEA) is performed to try to decrease the risk of subsequent stroke, the procedure itself may cause neurologic deficit. Multicenter CEA trials have clinically assessed the risk of major stroke or death from surgery and have found it to be low: a risk of 5.8% in symptomatic and 2.3% in asymptomatic carotid stenosis (2.5% and 1.9% when corrected for nonsurgical risk) (1, 2). These figures have been used to determine which subgroups of patients with carotid stenosis might potentially benefit from CEA. Does the clinical detection of a postoperative neurologic deficit provide a sensitive measure of perioperative cerebral ischemia? Transcranial Doppler sonography suggests that cerebral embolism occurs during the majority of CEA procedures (3–5). Although only a minority of emboli cause neurologic deficits detected by routine examination, others may cause subtle declines in neuropsychological performance (6) or clinically silent infarction revealed by imaging of the brain (7, 8). Diffusion-weighted imaging provides a highly sensitive tool for detecting cerebral infarction (9). We chose to use this technique to assess the risk of asymptomatic infarction from CEA. Since beginning recruitment, a study of similar design has reported its findings (10). We elected to publish our results sooner than planned on the basis of the marked differences between our results and those of that study. After obtaining informed consent from the participants and approval from the institution's review board, we prospectively studied 18 participants (12 male and six female participants) who were undergoing CEA (median age, 68 years; age range, 56–87 years). Carotid stenosis was diagnosed using North American Symptomatic Carotid Endarterectomy Trial criteria for digital subtraction cerebral angiography in seven participants and concordant Doppler sonography and MR angiography (2D time-of-flight) in the remainder. The imaging findings are detailed in the Table. In nine participants, carotid stenosis was symptomatic (Fig 1). Participants were excluded from the study if ischemic symptoms occurred during the 14 days before CEA. Multiple atherosclerotic risk factors were reported (hypertension, 14 participants; smoking history, 12 participants; hyperlipidemia, 10 participants; diabetes mellitus, five participants). CEA was performed with the participants under general endotracheal anesthesia, with continuous EEG monitoring, by one of two experienced neurosurgeons (J.M.Z., R.F.S.) (11). After vascular exposure, thiopental barbiturates were IV administered in addition to a heparin bolus. 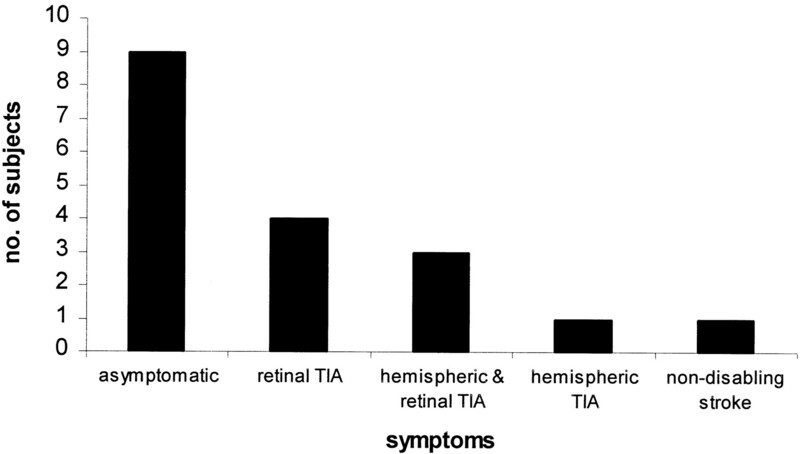 When effective thiopental EEG burst suppression was achieved, carotid vessels were clamped. After arteriotomy, atherosclerotic plaque was removed under operative microscope guidance. Arteries were back bled and flushed with heparinized saline before closure. Vascular shunting was performed in one participant who had a tandem stenosis of the intracranial middle cerebral artery and poor collateral vasculature. No participant showed a major intraoperative EEG change. In one participant with near occlusion of the internal carotid artery, operative appearances prompted an internal carotid stumpectomy. National Institutes of Health (NIH) Stroke Scale (12) scores were obtained both pre- and postoperatively (within 24 hours) for 14 participants by a neurologist not involved in their routine care. For the remaining four participants, routine pre- and postoperative neurologic assessment was conducted by the operating neurosurgeon. Preoperative diffusion-weighted imaging was performed as close to surgery as possible (median, 2.5 hours; range, 0.5–12.5 hours), with postoperative diffusion-weighted imaging performed a median of 15 hours after surgery (range, 1.5–58.5 hours). Imaging was performed at 1.5 T (General Electric, Milwaukee, WI), using a single-shot echo-planar spin-echo technique. A maximum diffusion sensitivity of b = 1000 s/mm2 was applied to three orthogonal planes. Axial images were obtained at 20 levels, both with and without the diffusion gradient (6500/101/1 [TR/TE/excitations]; section thickness, 5 mm; intersection gap, 2.5 mm; field of view, 32 cm; matrix, 128 × 128). Two radiologists (J.E.H., K.P.N.F.) independently interpreted the images, blinded to operative status and detailed clinical findings. Both isotropic and anisotropic diffusion-weighted images were examined for areas of signal hyperintensity suggesting ischemic damage. A Bayesian estimate with a noninformative beta was used to establish an upper bound for the incidence of an event with zero occurrences in a study sample (13). Interobserver variability was determined by the kappa statistic (14). Fisher's exact test was used to examine for a difference between our findings and those presented by Muller et al (10). Confidence interval limits were derived using standard statistical methods. Preoperatively, 17 participants had normal results of their neurologic examinations (13 were assessed by using the NIH Stroke Scale, and four were assessed by neurosurgical examination). One participant had an NIH Stroke Scale score of 6, reflecting a hemiparesis on the contralateral side. Only one participant showed a neurologic change after surgery, with an increase in NIH Stroke Scale score from 0 to 1. This was caused by mild postoperative confusion and clinically was attributed to a urinary tract infection causing mild metabolic derangement. Diffusion-weighted imaging results were normal for this participant. Preoperatively, one participant showed middle cerebral artery territory diffusion-weighted imaging hyperintensity in the hemisphere contralateral to the side of surgery. This was compatible with a history of recent hemiparesis and an NIH Stroke Scale score of 6. The hemisphere ipsilateral to the side of CEA was normal. In another participant, one third of the ipsilateral cerebral hemisphere was obscured by susceptibility artifact from an aneurysm clip, limiting interpretation. The remaining 16 preoperative diffusion-weighted images were entirely normal. Postoperatively, no new areas of diffusion hyperintensity were identified in any participant by either of the two observers (kappa value: 1.00). Our findings suggest that CEA is a safe operation carrying a low risk of clinically silent cerebral infarction. Our sample size to date enables us to calculate this risk as <10% in all participants and as <18% in participants with symptomatic carotid stenosis (P < .05) (13). Efficacy of CEA in stroke prevention depends on a low rate of perioperative stroke and death (1, 2). We were therefore encouraged by our results, which do not suggest a high incidence of additional unrecognized ischemic complications resulting from CEA. Our findings are markedly different from those presented by Muller et al (10), who observed multiple diffusion-weighted imaging hyperintensities in one third of their study participants after CEA. Their sample size enabled us to calculate the risk of diffusion-weighted imaging hyperintensity after CEA as being between 23% and 45% (P < .05). Comparison by statistical means revealed a significant difference between our findings (0% incidence: 95% confidence interval limits, 0–12%) and the findings presented by Muller et al (33% incidence: 95% confidence interval limits, 23–45%) (P < .002, Fisher's exact test). Can this difference be explained by study design? Both studies contained similar numbers of symptomatic and asymptomatic participants, with similar degrees of carotid stenosis. In both, diffusion-weighted imaging was performed using a single-shot echo-planar spin-echo sequence and similar diffusion gradients. Muller et al (10) did not include preoperative diffusion-weighted imaging in their protocol. This makes it possible that some postoperative diffusion hyperintensities reflected preexisting cerebral infarction. However, none of their participants suffered ischemic symptoms during the 14 days before CEA, making this unlikely to be the sole explanation. Postoperative imaging was performed during the same time window for both studies. Diffusion-weighted imaging has proved to be far more sensitive to acute cerebral infarction than either CT or conventional MR imaging (15, 16). Ischemic complications associated with CEA include both focal and global cerebral infarction, and diffusion-weighted imaging is well suited to detect both (17, 18). The high signal-to-background contrast seen in cases of cerebral infarction allows us to accurately detect lesions that are >30 mm3 with our protocol. Our sensitivity for detecting very small lesions is, however, limited by pixel size and intersection gap. Although diffusion-weighted imaging can detect parenchymal changes in humans within 40 minutes of severe ischemia (19), signal intensity and lesion size gradually increase during the subsequent 1 to 2 days (20, 21). To maximize diffusion-weighted imaging sensitivity to cerebral infarction, we chose to perform postoperative imaging during this time window. By doing so, it is possible that we missed transient diffusion hyperintensities of uncertain significance during the intervening hours (22). It is important for us to consider whether the disparity in results between this study and the study conducted by Muller et al (10) can be explained by differences in surgical technique. We used barbiturates during carotid clamping, to limit ischemia, and an operative microscope, to aid in the removal of atherosclerotic debris from the arterial wall before closure. Muller et al did not report use of either of these techniques, preferring vascular shunting to limit cerebral ischemia. If differences in surgical technique are important in determining perioperative ischemic complications, we would expect both the postoperative diffusion findings and the rate of clinically detectable stroke to be affected. Although the report of four persistent neurologic deficits (5.2%) presented by Muller et al falls within the accepted range of perioperative morbidity resulting from CEA (23), it is considerably higher than our own complication rate of 2.5%, derived from a review of 629 CEA procedures (24). Neither figure corrects for the nonsurgical risk of stroke or death. To achieve the benefits of CEA described by recent multicenter trials (1, 2), low complication rates are paramount. Diffusion-weighted imaging is more sensitive to perioperative cerebral infarction than is clinical assessment (10), and it provides an ideal method for the audit of cerebrovascular procedures. With this study, we show that diffusion-weighted imaging is a feasible method for detecting perioperative cerebral infarction and that this complication is rare during CEA performed at our center. 1 This work was presented as an oral presentation at the 38th Annual Meeting of the American Society of Neuroradiologists, Atlanta, April 2000. 2 This work was supported in part by the Kodak Radiology Fund Bursary, Royal College of Radiologists, England (to K.P.N.F.). ↵3 Address reprint requests to Joseph E. Heiserman, MD, PhD, Division of Neuroradiology, Barrow Neurological Institute, St. Joseph's Hospital and Medical Center, 350 West Thomas Road, Phoenix, AZ 85013.